Earlier this week, Microsoft released the first Service Pack (SP1) for its Microsoft Office 2013 suite and is now available for download from Microsoft servers. The SP1 is available for all Office 2013 products, including Microsoft Office 2013, Exchange Server 2013, and SharePoint 2013. According to Office blog, SP1 improves the compatibility with Windows 8.1 and Server 2012 R2 and includes fixes for various issues. The blog also notes that Office users will begin to get SP1 update notification via Windows Update service within the next 30 days. And if you’re running click-to-run (non MSI) version of Office, you will see the update within the next two weeks. However, users who can’t wait to install the SP1 can download x86, and x64 versions of Service Pack 1 from the links mentioned at the bottom of this article. Just like the Service Packs released before for Windows and Office products, SP1 for Office 2013 includes all previously released updates and fixes to various issues. The SP1 for Office 2013 doesn’t add new features to Office programs. The SP1 covers Word, Access, Excel, PowerPoint, OneNote, Publisher, InfoPath, Lync, OneDrive for Business, and Outlook applications. 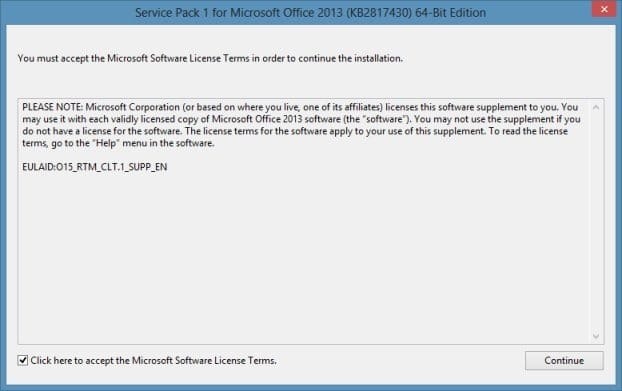 If you want to install SP1 immediately, depending on the version of Office 2013 version you have installed, download either x86 or x64 version of the SP1 from the link mentioned at the end of the post, run the installer, and then follow the straight-forward on-screen instructions to get it installed. The download size of the 64-bit installer is about 700 MB, and the 32-bit installer is about 643 MB. Before running the SP1 installer, make sure that you have at least 3GB of free space on your system drive to avoid errors. And if you want to check if Service Pack 1 is already installed, you need to open Programs and Features window and then check the version number of Office 2013 program. If the program version is 15.0.4569.1506 or higher indicates that the SP1 is installed. And if you’re running Microsoft Office 2010, you can download SP2 for Office 2010 from here.